My grandmother is guilty of passing on false information. That’s not to say she was a liar, but that she protected her recipes within an inch of her life. The recipe for the Italian Creme Cake she so loyally baked every birthday and Christmas was typed out on a three by five index card, with the name of it’s original baker, “Ruby,” written in her script at the top right corner. However… this recipe card, though it’s been followed, shared, and framed in my kitchen, is not the real recipe. Her sweet bread loaf, I’ve never been able to replicate. I have no idea how it was actually made. The same goes for her angel biscuits, jam cake, cooked caramel icing, and her peanut butter balls, in a way. 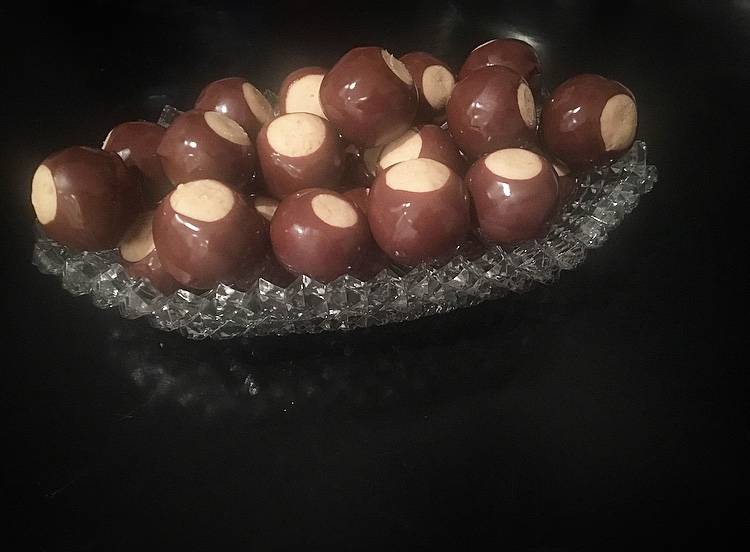 Over the years, I’ve turned out at least one batch of these every holiday season, and if done correctly, get eight dozen perfectly-shaped, quarter-sized bites of goodness. A can of flaked coconut equates to about a cup of the packed flakes. I prefer pecans for the non-descriptive “chopped nuts,” and melt real butter instead of the margarine the index card calls for. Still, though, I’ve found no proper measurement for the parafin. 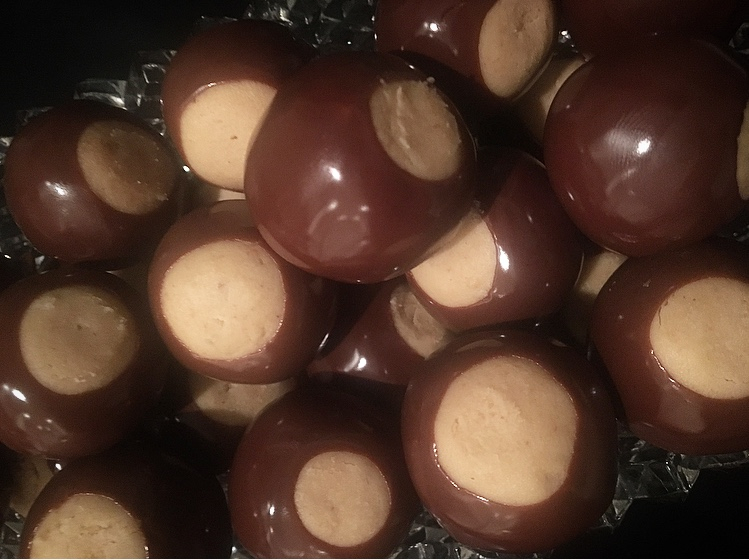 The result is a buckeye-looking “deluxe peanut butter ball” according to those who eat them. While the idea of eating a little parrafin wax is off-putting to some, I find that it melts a thinner dipping cholocate that coats easier and dries more slowly and therefore less lumpy than the pre-made dipping chocolate counterpart you can find in any grocery store these days. They taste like Christmas. 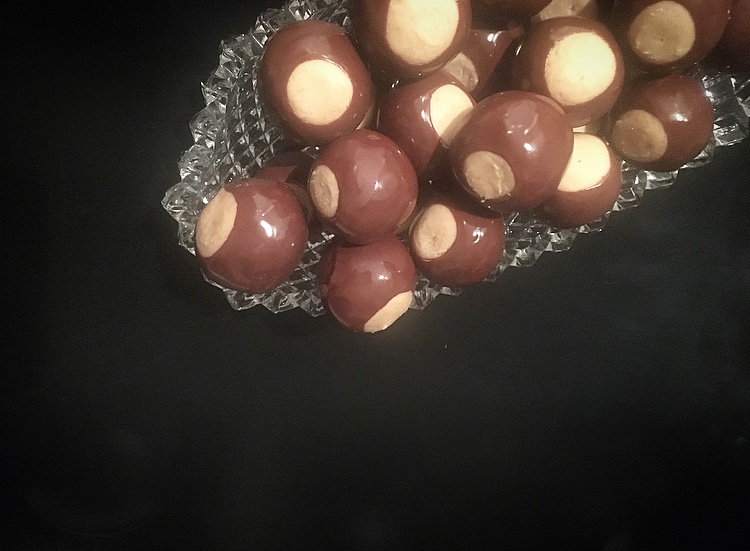 They bring back memories of my grandpa standing anxiously at my right, ready to remove and re-insert the toothpicks we used to dunk into the melted chocolate. They make me think of family gatherings and wax paper in a decorative tin box. And, whether or not its the real recipe, they taste perfect. Mix together the first 6 ingredients, and form into quarter-sized balls on wax paper. 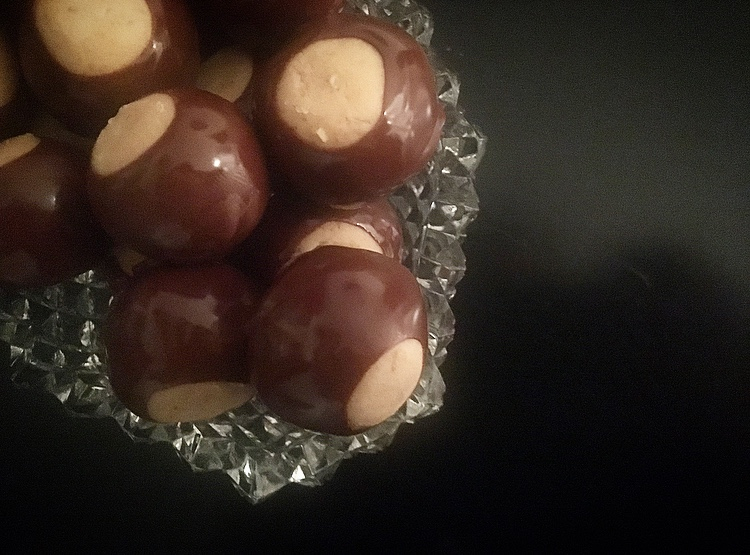 Melt together the wax and the chocolate, and dip the peanut butter balls in almost all the way. Let sit until hardened, then use finger to cover the toothpick holes.